Nectar Mattress is one of the most favourite mattresses of many Americans. It is a fusion of 4 layer mattresses that dispense a cool breathable sleeping surface, which makes every person rest comfortably, with a memorable foam feel that reacts according to your body temperature. This famous Nectar Mattress, built with the absolute fabric material and mattress layer, is custom made to balance comfort and support. These classic features were designed for the liking of all kind of sleepers. The urge of going home and lying down on a smooth and comfortable mattress is what everyone needs from a very long and stressful day. Well, it is true that people spend a third of their lives sleeping. So, it is a must to invest in a great material that a person uses every day. The Nectar Mattress is the perfect choice to invest with this kind of necessity. This type of mattress will make you more difficult to wake up on manic Mondays and the rest of the week as well. Are you curious why? Well, it’s because this high-quality and most competitively priced dense foam mattress was made for your comfortability and satisfaction. It has four foam layers which contain a cooling technology built into the cover. With that, it will provide pressure relief and creates a long-term support for your back and body while maintaining its temperature. Say goodbye to your uncomfy sleep and the groggy day marked with back pain. Shift to this new and upgraded mattress. To learn more about our product, check our Nectar Mattress Review below! Nectar Sleep is an online company that manufactures high-quality and skillfully crafted mattresses that satisfies all body types and shapes of different sleepers. They created such great mattresses, and aligned all their efforts around one simple promise: The best sleep of your life, guaranteed. As a matter of fact, the company have taken recent studies to advance the usage of mattress materials and fabric technology. Considering the effects and level of firmness, coolness, breathability and comfort. The company offers state of the art mattresses that make every single experience makes everyone think its the best mattress anyone has ever slept on. Nectar Sleep commits to creating mattresses with an excellent quality and comfort. There is no doubt that the combination of the modern technology and high-quality materials is made to satisfy. However, there are a lot of things that need to be considered, specifically a person’s sleep preference, in figuring out the worth and capability of this material. This Nectar Mattress review will help you to thoroughly decide if its good or not. Adore memory foam. If the comfiness that makes you feel like living on your bed is your type and a deeper-cradling hug experience feature, then this mattress will be your best choice. As a matter of fact, Nectar’s design is breathable and helps reduce heat retention, competing with the traditional memory materials. Need pressure relief. The Nectar Mattress was made to make your body firm for support, comfortably soft, and a bouncier than other premium memory foam from the Nectar gives rejuvenating essence to your entire body, as well as in the shoulders and hips, wherever part of your body’s choice. It contours to curves and reduces pressure, which works wonders for people who tend to sleep on their sides. Are considering a remarkable value. The company offers a full year trial period to test the lastingness and comfortability of the bed. As a matter of fact, these beds were invented conscionable and exactly for different people’s sleeping needs at a truly less pricey cost. The brand even provides a full year in its trial period to see if you feel well rested, which translates into overall peace of mind with the purchase. You don’t like firm mattresses. The Nectar Mattress was made with medium firmness to satisfy sleepers comfortability standards. This is because the last two layers of the mattress are firmer than usual. You’d want to test it out. Nectar Mattress is accessible only via online. There is no shops or displays for it to try. However, you have 365 days to have a trial to test the mattress on different seasons of the year. Really cheap mattresses bottom out easily and do not provide a good deal out of your cash. A mattress that necessitates supporting your body weight and composition and won’t hit bottom is what you truly need. 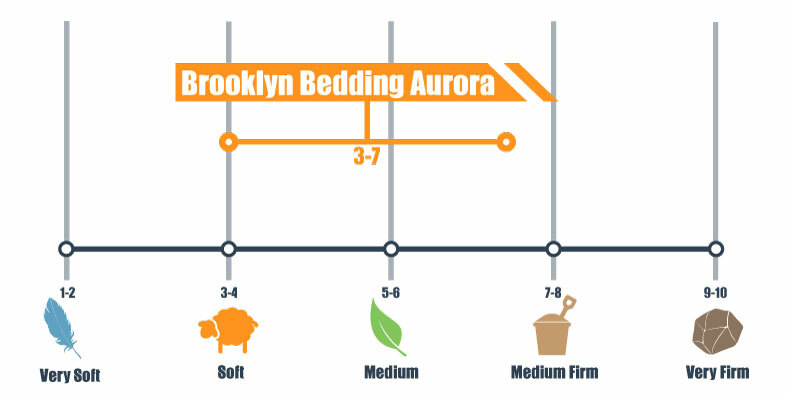 The Nectar Mattress has a medium firmness which is basically a 6/10 on the firmness scale. On our firmness scale, we gave Nectar a score of 6 to 6.5 out of 10, with 10 being the firmest. This score lands on the versatile medium range that is befitting to accommodate a different variety of sleeping needs and preferences. The first thing you will remarkably notice about Nectar is its notably luxurious and soft quilted cover which leaves you a feeling of genuine comfort while offering you an extra layer of pressure-relieving memory foam. While lying on the bed, you will feel your entire body slowly sinking into the upper layers which compensates to a welcoming, deep hug. These comfort layers are gradually and slowly responding, unlike the quicker- responding layers at the base. The bottom two layers are noticeably firmer, and the brand has done a nice job of combining pressure relief and comfort with support. It is also important to note that even lighter parts of the body sink in comfortably, creating a nice uniform feel to lying down. Though mattresses that cradle your body can sometimes retain heat, Nectar’s cooling features, like the gel and breathable cover, will help keep you from sleeping hot. As with most memory beds, there is not a deep bounce. Though the foam is slow-responding and there is a deeper hug, you likely will not experience that “trapped feeling.” This can be important if you are a combination sleeper who tends to rotate between sleeping positions or value ease of repositioning. Overall, the balance of firmness in the foams and cradling pressure relief will suit a range of different sleeping preferences and needs. A personal preference mostly matters when considering a sinkage test of a certain mattress. Few people like the feeling of sinking when indulging at the dense foam, and others don’t. To test the sinkage level; of a mattress, experts use four balls that vary in sizes and density. This ball helps to imitate different body weights and parts to display the level of sinkage of the mattress. According to other reviews, a 6 lb (pound) medicine ball has a level of 1” (inch) of sinkage; an 8 lb medicine ball obtains a level of 1.5 inches of sinkage; a 10 lb steel ball results in a level of 2 inches of sinkage, and; lastly, a 50 lb medicine ball has a level of 4 inches of sinkage, . As specified, the Nectar is a high-thickness sleeping cushion, built with numerous layers of froth. It has a low movement exchange, effortlessly engrossing any development or unsettling influence, giving both you and your accomplice a peaceful night’s rest. In the event that you share your bed with someone, you will need to know how much unsettling influence you will feel when the other individual gets into and out of bed or hurls and turns amid the night. This next test is intended to demonstrate the force of movement that is noticeable from one side of the sleeping cushion to the next. Edge support is something you might need to consider on the off chance that you lay down with a partner and need to involve a more prominent surface territory. Edge bolster while lying or sitting on the edge can be essential to a few people, yet not to all. Bed-in-a-box models don’t have a tendency to have edge support as their solid suit, and Nectar is charmingly shocking when resting on the edge. It feels steady and not in any way like you will take off of the bed. Nonetheless, when sitting on the edge with weight much more moved in a little space, there is some pressure. On the off chance that you anticipate offering the sleeping cushion to a sleeping partner and need to utilize the whole surface region of the bedding, at that point edge support is essential to note. Froth sleeping pads can at times have pressure issues when contrasted with customary innerspring beddings, so you need to perceive how the Nectar performed while both sitting and lying close to the side of the bed. On Sitting on the edge, like putting shoes on in the morning you will notice that it had some compression. However, it is understandable because this is normal on most memory foams. Meanwhile, on laying on the edge of the mattress you will observe an even support from the centre of the mattress to the side. Rolling around is not an issue or even hanging off a bit will not cause too much compression. The Nectar Mattress is composed of enhanced and upgraded layers that perfectly suits to everyone’s satisfaction and demands. Each layer was studied and analyzed for a greater combination and usage. The materials used in these mattresses are designed and created innovatively for better comfortability and support. The Nectar has an ultra-thick foam structure that offers all-around adjusted levels of help for an agreeable rest after quite a while. It has an assortment of highlights, consolidating one of a kind breathable outline and customary adjustable foam to keep you cool and keep the feared night-sweats. The Nectar 11″ sleeping cushion is developed with five layers of froth, considering even weight dispersion and embraced in feeling. The top cover of Tencel-infused fabric provides a breathable, cooling layer that is also bedbug resistant. Next, a quilted gel memory foam layer pulls heat from the body, maximizing the cooling and offering pressure relief. The third layer is Nectar’s patented LushFoam, which allows for optimal weight and heat distribution and is a top-rated gel memory foam. High Core adaptive foam works to provide support. The final layer of breathable high-density foam gives the Nectar its stability and maximizes airflow. Breathable design, Tencel-infused quilted cover and multi-layer memory foam construction make this an excellent quality mattress that is sure to give you a comfortable, restful sleep. The Nectar does not require a foundation and can be placed anywhere you wish, as long as it is a dry surface. It can sit on a platform, a box spring, or an adjustable bed frame that fits an 11” mattress. It can also be placed directly on the floor. The cushion cover is made from a highly efficient fabric known as tencel which is an eco-friendly material from eucalyptus trees. It is designed to stay dry by preventing moisture build up. It begets a smooth surface texture with high breathability. If your cushion cover gets damaged, Nectar provides a free one-time replacement. As a bonus, they pay for the shipping fee which you can’t avail from any other mattress brand. The key feature of the Nectar is its minimalist-looking cover made from a blend of cotton and tencel, which is part of the Nectar’s cooling system. The Nectar logo gives the cover its classic look together with its white checkered pattern and grey side panels. The cover can be unzipped and spot cleaned with ease which is a bonus feature. The tencel fibre, a highly breathable material is what makes up the mattress cover. This cover is prepared with an aloe-based cooling layer to assist air wicking and does a good job at circulating air throughout the upper layer, optimizing circulation to absorb heat and keep you cool. Since it is a breathable material, it is soft to touch. It sleeps cooler than cotton and helps absorb away moisture. Cleaning the cover is not a problem. Just take off the cover placed around the mattress and put it in the washing machine. Aside from it is OEKO- TEX certified and at the highest level to guarantee the materials are safe enough to be used by babies and children, it is also bedbug resistant. The top 1’’ (inch ) comfort layer handles the weight distribution and relief for pressure points are made from quilted gel memory foam to provide loft, air circulation, and perfect contour to your body. This gel memory foam provides softness and luxurious feel to the top layer. Primary support, rebound, and bounce are created in the second 1” foam layer. This layer’s adaptive high-core memory foam could be described as “lush,” and provides comfort, in addition, to support with 1-inch, four-pound, semi-open fast recovery gel memory foam. Underneath that is a quilted cooling gel foam layer which gives a unique feel and provides great pressure relief. Medical grade cooling and recovery levels are managed by the third 3-inch transition layer. This 3-inch, three-pound memory foam acts as transitional support layer between the upper and lower layers and also aids in cooling. The fourth layer is what they call High Core Memory Foam. This is a dense foam that is also great for pressure relief. Finally, the foundation layer is a 6-inch, two-pound high-density foam made available to support deep compression. This serves as a stable foundation with its breathing base layer and reinforces the contouring layers. Unlike other memory foam or hybrid mattresses, the NECTAR is designed for any support surface and the warranty does not require the use of a box spring, a feature that many NECTAR users report as being helpful. Many reviewers also love that the removable cover is washable and have reported success in receiving free-of-charge replacement covers. This is a standard base layer similar to most other memory foam mattresses but is essential for providing good support. It is an excellent option if you are looking for an all foam mattress that sleeps cooler than the traditional memory foam alternatives. This 11” all foam thick mattress made from four special grade performance layers, all of which were designed with cooling and airflow in mind. Durability of this mattress memory foam is engineered to provide a comfortable, conforming sleep surface that retains its original shape over time, but indentations are to be expected. The Nectar mattress has earned a customer satisfaction rating of 70%, which is significantly below-average compared to other memory foam mattresses. Inconsistent customer service and delivery delays are two of the top complaints. Waking up in the morning is one of the toughest challenges everyone experienced in their daily lives. Especially when you wake up having neck and back pains due to uncomfy and short in size mattresses. Worry no more, Nectar Sleep offers you nothing but the best mattresses just right for you. Having trouble on choosing what size suits you? Here’s a breakdown of which size will work best for your specific situation. The Nectar Twin Mattress is the perfect size for your older children once they outgrow their baby cribs. This size is also suitable for adults living on their own. The mattress measures approximately 39” (inches) wide, 72” (inches) long, and 11” (inches) thick. The twin bed only fits one person, regardless of what its name implies. Furthermore, despite its size, it’s not suitable for taller person. It will make him/her sleep uncomfortably. However, don’t fret because the company offers other options. The TWIN XL is helpful for those taller individuals, as it is the same width and height as the standard twin, but upgraded and extended five additional inches. Most of the American individuals are tall, hence this is the perfect size for them. This bed is also suitable for young individuals who are just starting off to be independent and still wants to experience comfortability and luxurious bed with a very reasonable price. The CAL KING is also great for tall individuals, as it is the longest of the standard sizes, measuring 84” long. A full-sized Nectar mattress measures approximately 55” (inches) wide, 74” (inches) long, and 11” (inches) thick. It may sound big but is it actually quite small for couples and to a person who likes to toss around and turn a lot while sleeping as well. This mattress size is a perfect option for standard sized bedrooms for it will fit comfortably. When considering a room-size, the full mattress is a perfect choice. It is generally, measured on Taller individuals are highly recommended to skip a full-size mattress altogether. The queen mattress is a perfect size for couples. It is believed to be comfortably compatible with two persons. This size is actually the company’s top seller. The queen measures approximately 60” (inches) wide, 80” long and 11” (inches) thick. The bed had actually enough inches for the comfortability of taller individuals. This size is recommended in most of the master bedrooms, giving enough space for other things, furniture and cabinets. It is enough size for average size rooms. However, this size is not ideal for a growing family that loves to join their kids on their beds. On top of all, here’s a size that finally whose name befits its size. a mattress whose name befits its size. The king-size mattress is so-called because it is the largest of the four main mattress sizes. Measuring in at a whopping 76″ wide by 80″ long, the king is a full 16″ wider than the queen. This size is recommended for couples, who want to have their most personal space even being together. If at least one person tosses and turns a lot during the night, the king provides the best insurance that the other person won’t wake up. This size is ideal for master bedrooms as well. For it is massive and spacious to all sleepers. The California King Mattress is measured approximately 72” (inches) wide, 84” (inches) long and 11” (inches) thick. This mattress size is massive which is perfect for couples who love to toss around while sleeping and also to a growing family of four. This size of a mattress may come with challenges in terms of moving it into places, like tight turns, low ceilings, narrow hallways and even undersized doorways. Room size must be highly considered in choosing this size. However, to avoid these scenarios, one must measure all hallways, doorways, and especially the bedroom. With that, this ensures that the mattress will look perfectly great in your bedroom. Most of the people consider first the cost rather than the quality of purchasing a certain material. Worry not, Nectar Sleep offers very competitive prices for each different size of mattresses from their thousand competitors. Many of the reviewers are surprised with such low cost but experienced exceptional and high-quality material. The table below shows the premium prices of the mattresses according to its sizes. As you observed, the most affordable mattress costs only $500, a twin mattress, and the most expensive is $900, a California king mattress. What are you waiting for? Grab this opportunity now and experience a luxurious mattress at a very low price. Looking for the bed of your dreams? Well, Nectar Mattress is the perfect luxurious and comfy bed just right to satisfy your daily night sleeps. Spoil yourself and indulge in this amazing med mattress that everyone dreamt of. Everyone would ask, is it worth to take a little risk to invest in this kind of mattress? Let’s face it, finding the perfect mattress that suits your needs and demands is quite tough and challenging. However, choosing a high-quality mattress is a great long-term investment in regards to your sleep quality and can even provide a pain relief. What’s great about Nectar Mattress? It offers a lifetime warranty! You will also be given a 1 year of trial use to test the comfortability of the mattress on different seasons. The Nectar mattress can be shipped in anywhere in the United States, even in Alaska, Hawaii, and Puerto Rico. Shipping is free for deliveries on the 48 states. The warranty below was obtained from the Nectar Sleep Website. Your new Nectar mattress is covered by a Limited Nectar Forever Warranty (the “Warranty”) for the full period of the original owner’s (“you”) ownership and use. This warranty is valid only for the original purchaser from the original purchase date of the Mattress and is non-transferable. The “original purchaser,” for the purposes of this Warranty, is the first purchaser of the Mattress from Nectar or a Nectar authorized retailer. Please retain a copy of your receipt as proof of purchase and owner. If the original purchaser sells or otherwise relinquishes ownership of the mattress to another, this Warranty terminates and the subsequent owner accepts the product “as is” and “with all faults.” What is warranted? This Warranty extends to mattresses manufactured by Nectar Sleep (“Nectar”) and purchased directly from Nectar or Nectar’s authorized retailers (the “Mattresses”). Some parts of this Warranty also extend to covers sold with Mattresses. Nectar warrants the Mattress in its original packaging sold to you against the defects in material and workmanship set forth below (“Defects”) for the full period of ownership by you and use by you commencing from the time your Mattress is purchased by you. Replaced or repaired Mattresses are subject to the same Warranty as the original Mattress. For example, if you obtain a replaced or repaired Mattress the warranty term of the replaced or repaired Mattress begins from the date of purchase of the original mattress. The following defects are covered. Deterioration causing the Mattress to have a visible indentation greater than one (1.5″) one and one-half inches that are not associated with an indentation or sag which results from use of an improper or unsupportive foundation or bed base. Normal wear requires that a Mattress is continuously supported by a matching foundation or adjustable bed base with a proper bed frame sufficient to support the collective weight of the Mattress and user(s). Any physical flaw in the Mattress that causes the foam material to evidence degradation, split or crack, despite normal usage and proper handling. Any product which has been subject to misuse, neglect, accident or used in violation of instructions, including instructions to place the mattress on a proper bed frame. Defects caused by physical abuse or damage to the structure and/or cover material, including but not limited to, burns, cuts, tears, liquid damage, or stains. For the first 10 years of ownership, we will replace your mattress with a brand new Nectar at absolutely no charge to you. In years 10+ Nectar will completely repair and re-cover your Nectar, or replace your Nectar, at Nectar’s option. The only charge you will incur will be transportation costs of $50 each way, which charges will be waived if a Defect is confirmed to exist by Nectar. Discount Code: Confident that the Nectar is the suitable mattress for you? Then grab the opportunity now? Buy now and use the discount code “ “ to get $130 off of your purchase. Enjoy sleeping in one of the world’s most popular mattress – Nectar. Delivery Offers: The Leesa is available in Twin, Twin XL, Full, Queen, King, and California King Sizes. The average weight of these mattresses weigh from 45 to 89 pounds. However, without any handles and being somewhat of a floppy nature, the Nectar can be a little bit challenging to move and maneuver. Shipping is entirely free via UPS (United States Postal Service), and your built-to-order mattress is ready to ship in 3-5 business days. The Nectar is shipped in a compressed box and purchasers are given a tracking number once the mattress leaves the factory. The mattress is also very easy to unbox and is ready for you to enjoy in just a short span of time. Returning a defective and uncomfy mattress is actually easy. If you find that you don’t like it within the 365 day home trial period, you just contact their customer service department and they will arrange pickup of the mattress. You do not have to put it back in the box and you do not have to pay return shipping. The Nectar Mattress can go well with or without a frame, as long as the floor is a flat surface, sturdy and solid. However, most of the people choose to install bed frame to match their interior designs in their bedrooms. With that, Nectar Sleep recommends a variety of bed frames that perfectly suit your high-quality dense foam mattress. The Nectar mattress is a perfect match for different types of bed frames. These solid base frames will support not only your mattress but also you and your family. Box spring, divan bases, traditional frames, and adjustable bases are just a few of the many bed frames that can easily go well with the Nectar Mattress. One thing that must be considered is bed frames should be strong, sturdy, easy to make and move, and a complete support of your mattress. Perfectly positioned bed frame will provide the most support possible and let you avoid nights spent in pain and discomfort. Due to allergens, dust, dirt, pet hair, and moisture, it would be best to consider installing strong and sturdy bed frames. It will allow you mattresses to keep its last layer clean. Despite its sizes, Nectar mattress is delivered or shipped right in front of your door and it arrives in a giant roll covered by a blue cloth which is waterproof. The blue cloth gives protection on the mattress from water, dust and dirt. How to unbox it? Simply remove the outer layer and you’ll notice the cover or blue cloth. The mattress is vacuum packed to avoid dirt from air and moisture from coming and out. It has handles on it to make it easier to transport. After unpacking the outer layer and cover, you will notice that it will expand into its full state. Nectar mattress is known to be a denser foam mattress. As such, it will be more prone to off-gassing. It is because it contains a material to off gas. However, don’t worry about the smell will go away after 3-4 days. One of the reviewers recommended opening the mattress in the morning so that the mattress will have enough time to breathe and cast off the packaging smell. Note that the smell is only temporary. Is it worth the risk to invest on Nectar Mattress? Well, Nectar Mattress gives you the opportunity to invest on your sleep that you do almost third of your life. The Nectar is certainly the best choice to consider cost without giving up the luxurious and comfortable way of sleeping. As an individual, a couple or even a growing family, Nectar Sleep offers you nothing but the best of your sleeping experience. Say goodbye to your old, smelly, and unsturdy mattress, and switch to the new, comfy and luxurious Nectar mattress. Lastly, the company gives you a lifetime warranty for your mattress. If there is any defect or any discomfort while using the product, Nectar Sleep will help you to replace and ship back the mattress for free. We hope you learned a lot and enjoyed our nectar mattress review. May you have a great and comfy sleep!